“Whew! 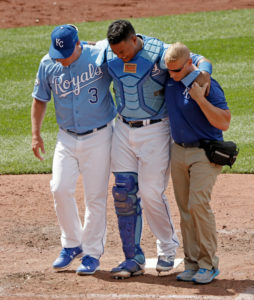 !” says everyone in Kansas City, now that we learned that fan favorite and All-Star catcher Salvador Perez has only a thigh bruise and will only be out 7-10 days from an injury sustained against the White Sox in a collision with 3B Cheslor Cuthbert. The injury bug has not been friendly to the Royals as of late. Alex Gordon has a broken wrist and Mike Moustakas has a torn ACL. So with Salvy’s injury, isn’t it “just a bruise,” or is there more to it? While “bruise” doesn’t sound too bad, these can be very painful and can considerably limit athletic ability. The thigh muscles are big muscles with lots of blood pumping through them. When athlete’s get thigh bruises, mostly from collisions, they usually swell almost immediately. They swell so bad because of the amount of blood flow as well as how thick the muscles are – the blood pools and just sits there like stagnant water. Therefore, any kind of contraction with running or in Salvy’s case, having to squat deeply and get up from that position quickly, can be very painful. 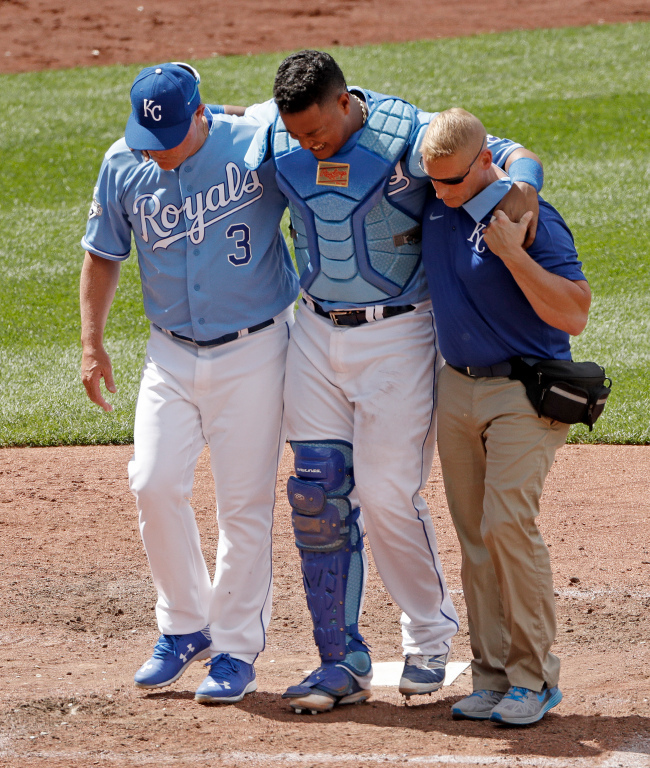 No question, this injury would slow Salvador Perez down and not make him as effective as he normally is. So what will Salvy’s rehab entail? Well, we should say if he was with us at SSOR, here’s what it would look like. 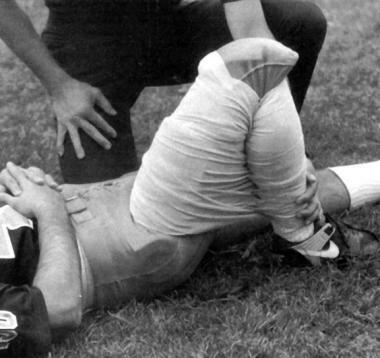 More than likely, he’s got a compressive wrap around his thigh to push some of that swelling out of the area. Depending on how painful it is, we may or may not use a crutch to help unload the leg a little so he doesn’t limp. Limping is no good with any injury. It just causes improper patterns and the muscle won’t be working properly anyway. He’ll have a short period of “active rest” where he would do exercises in the pool or some light cycling to help eliminate swelling. Getting the muscle to work actively is the best way to pump that fluid out. We would do some light massage with the leg elevated as tolerated to help facilitate fluid removal from the area. The other integral part of rehab for a thigh bruise is icing the thigh with the knee bent as much as possible, pictured below. Stretching the muscle coupled with ice helps further squeeze the swelling out of the thigh. Electric stimulation could be used for pain relief, and pulsed ultrasound might be used at the “epicenter” of the bruise to help break up the hematoma. The important thing to consider with these injuries is to get the blood/swelling out as soon as possible. Otherwise, the swelling can harden and cause heterotopic ossification, which is when bone forms in an area where it shouldn’t be otherwise. Heterotopic ossification is part of a condition known as myositis ossificans. That’s why these injuries can either be a 7-10 day injury, or be an injury that causes long-term issues. Icing the knee in maximum flexion to help reduce pooling of blood in the area. Key criteria for progression of this injury are normal walking gait, the ability to get the heel to the glute for running, and for him, the ability to get in the catcher’s position with minimal to no pain. Obviously, Salvador Perez has to be able to run at full speed too. Once he can do these things, he’ll be back behind the plate again. Hope this gives you an idea how to rehab a thigh bruise. Definitely not “just a bruise.” This can become a nagging injury with long-term implications if myositis ossificans results. If you have a thigh bruise or any other injury that’s keeping you out of the games you love, give us a call. It would be a privilege to partner with you in your care.